In the past 12 months it would appear that outdoor company The North Face have made a concerted effort to claw back some ground on the runaway trail running freight train that is the all conquering Salomon. A focus on rebuilding their dwindling athlete ranks saw the high profile signing of Western States 1oo champion and course record holder Timmy Olson joining from Pearl Izumi late last year. The investment in Jez Bragg to go off and traverse New Zealand in world record time and their continuing support of high profile races like UTMB, UTMF and the San Fran 50. But one thing has always been evident at a local and global level. When it comes to grabbing a pair of shoes and backpack and heading out the door for a trail run or to race in an ultra – rarely would you see athletes of any ability reaching first and foremost for their North Face gear. Why ? Well from our own exposure to the various brands and using our own hard earned cash it was simple. The investment in the design and function and overall build quality of their trail gear did not match their superior reputation they have in mountain gear let alone the advances made in trail running by Salomon et al. So the brand is strong, yet as we see each year from our gear survey, their stranglehold on the consumer is less dominant. Can we see them turning a corner with the recent introduction of two new shoes to their line up ? The Hyper Track Guide and Ultra Guide rolled into their 2013 catalogue and by all accounts are selling real well. I have been ramping up my training over the last 5 months as I head to a showdown with the iconic Western States course on the last Saturday in June. And at the beginning of any training block I make a number of key decisions early on to allow me to maximise my training. Firstly, I settle on my nutrition strategy, then I decide on my clothing and backpack strategy (easy for WSER – handhelds) and I also decide very early on which shoe to wear as I will get a number of pairs and rotate them. I had already dialled in the Salomon Sense Ultra as my 100 mile shoe as early as January. Then I tried the Ultra Guide after a recommendation from the guys at Footpoint and all of a sudden things got confusing. Should this actually be the shoe I should be racing in ? On the shelf the shoe didn’t do much for me from a visual perspective. Looked a little retro and quite an old design in its upper. It did feel light and had this rather strange curve to its sole. Putting the shoe on for the first time did surprise me as they felt so light and yet very very comfortable. They are aimed at the neutral runner seeking a shoe to support and be comfortable over the longer ultra distances. They have packed a lot of cushioning into a very light shoe. My US 11.5 tipped the scales at a meagre 315 grams which impressed me looking at the size and thickness of the sole and also the rather antiquated looking upper. As with all our tests at Ultra168 we rack up at least 10 hours of use before writing a post. Straight out of the box the first run with these shoes was over and around my standard Mt Solitary run in the Blue Mountains on an unseasonably wet and cold day. 45kms later, 3 leech bites and 6 hours and 2000m of climbing. The start of the run includes close to 500m of descent on widish fire trail before tightening up into more technical single track with rocks and roots and fallen trees. A prefect testing ground. 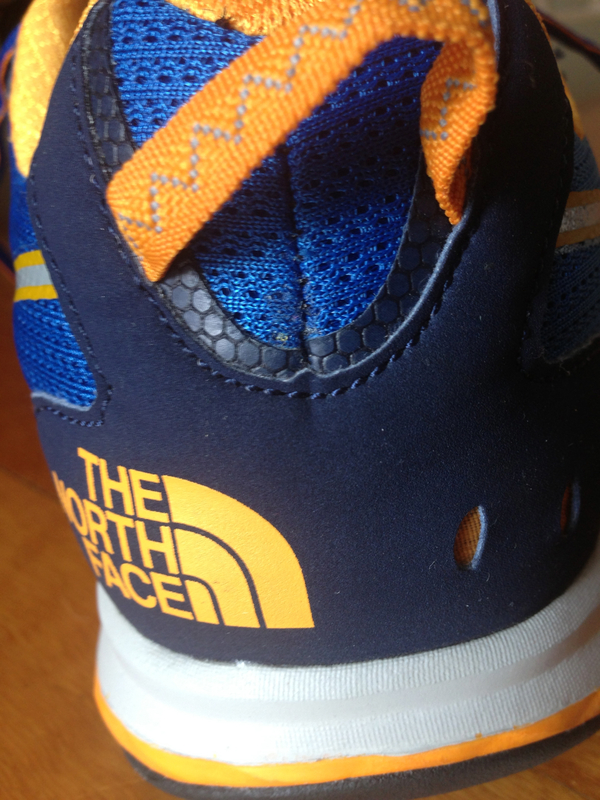 I immediately felt the huge amount of cushioning North Face have crammed into this shoe. If I was blindfolded I would have sworn I was in a pair of Hoka’s. The expected rocky feel under foot was totally lacking, all I had to remind me I was on trail was the slight roll I felt when I got a little out of shape on loose rocks at speed. They really started to give me greater descending confidence once onto the single track where I was able to really pick a line way in advance of a line I would normally take in a pair of my more minimalist shoes like the Sense Ultra. The grip was sensational and very aggressive even in these somewhat rough conditions but more on that later. I started to have too much fun and with this massive descent you are rewarded with over 600m of climb back up the other side on much steeper more difficult trail. I was thinking that as this numb feeling or lack of trail feel was great for the down, I may have to compromise the ability to get up on my toes when ascending. This is where this shoe really wowed me. I was instantly tipped forward onto my toes and able to get a real push off as the slope steepened to more of a scramble. The teeth like tread pattern bit into or moulded around the loose wet rock and I was able to move at a pace more akin to a lightweight zero or low drop shoe like an Inov8 Talon 190. How have they done this ? Well the shoe has an 8mm heel to toe drop yet it feels more like a forefoot runners shoe with a lower drop due to its curved toe to heel shape (It looks more like a boat in profile). This is based around the fact they have added something called a Cradle Guide. This is clearly where the shoe gets its control from. They have basically added a second high density EVA running the length of the shoe underneath of the normal cushioning found in all road shoes. The shoe is really boosted in its protection and control all the way from the heel with a real focus in the mid to fore foot. This is where this numb type of feel I keep talking about was coming from coupled with the usual snake plate they have used for a number of years on their shoes adding to the protection. The vintage looking upper provided adequate lacing set up and the tongue kept most rock debris at bay. The design and materials used in the upper dont seem as progressive as the other parts of the shoe and yet they functioned well enough. 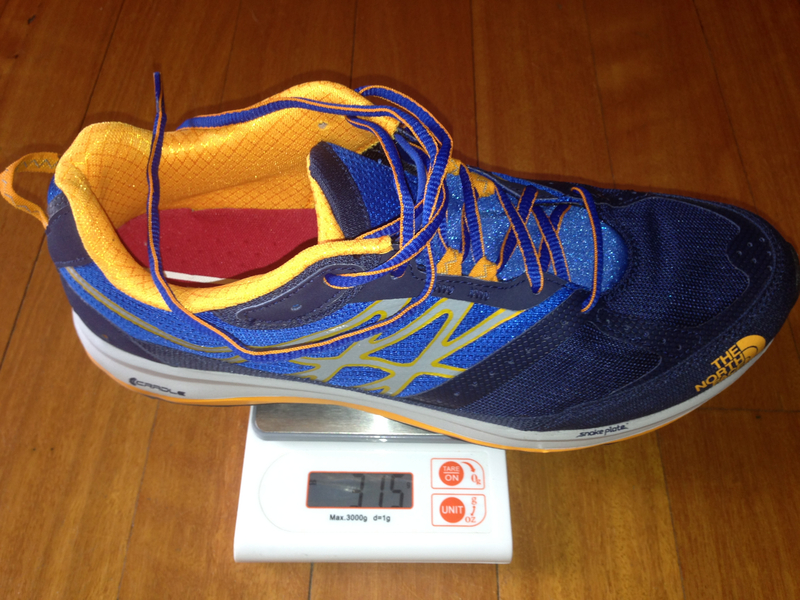 In the toe box, the room was a little wider than most shoes but not as wide as we are starting to see on some shoes specialist and dedicated ultra running shoes such as Altra’s. The toe box also seemed to have a little less protection than say Salomon shoes which did make me question the thinking considering this shoe is aimed squarely at the ultra and 100 miler runner where stubbing a toe 20 hours into a run is a given. The shoe drained well and picked up very little debris inside after river crossings and yet the very top of the tongue and collar stayed wet for a good 24 hours after running. It is the grip that makes this shoe a real stand out for me. It wanted to grab on to any type of surface and it has that rare balance of quite agressive lugs, yet not so intrusive you feel them on the hard packed stuff. Also the teeth of the tread seem to be well spaced so as not to pick up too much of the trail with each stride, keeping the weight down when plugging through the boggy stuff. On steep loose descent when you can get a little back on your heels the grip and stability was always there. In the last month I have added over 600kms to these shoes and the tread has worn exceptionally well with very little degradation from heel to toe. In fact, I would go as far as saying that this is a brilliant shoe and perfect for neutral runners of sound ability on the rough stuff who want great cushioning and incredible grip when looking to spend anywhere from 10 hours to 40 hours on the trail. But that is where the good news ends. 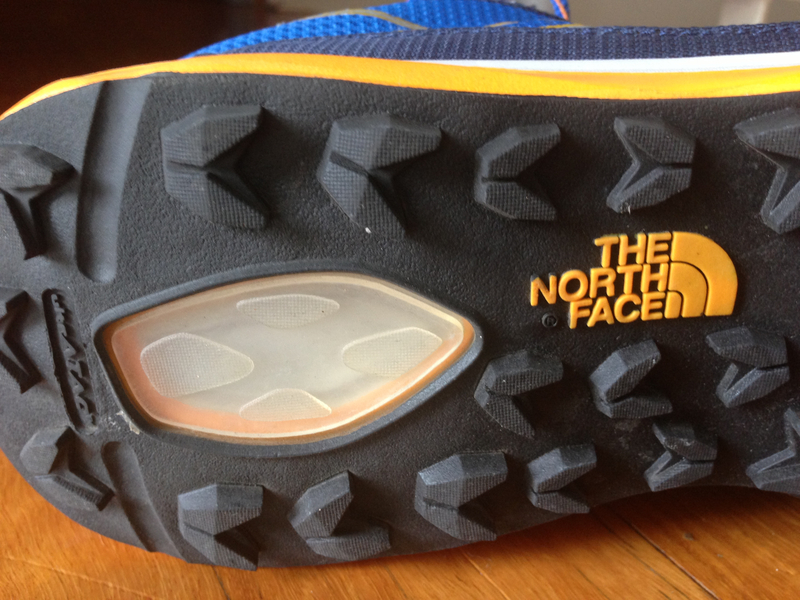 The one thing always nagging me about North face shoes has been their build quality. I went through a couple of review pairs of the Hayasa’s last year before I finally got a pair to stop delaminating around the toe area. 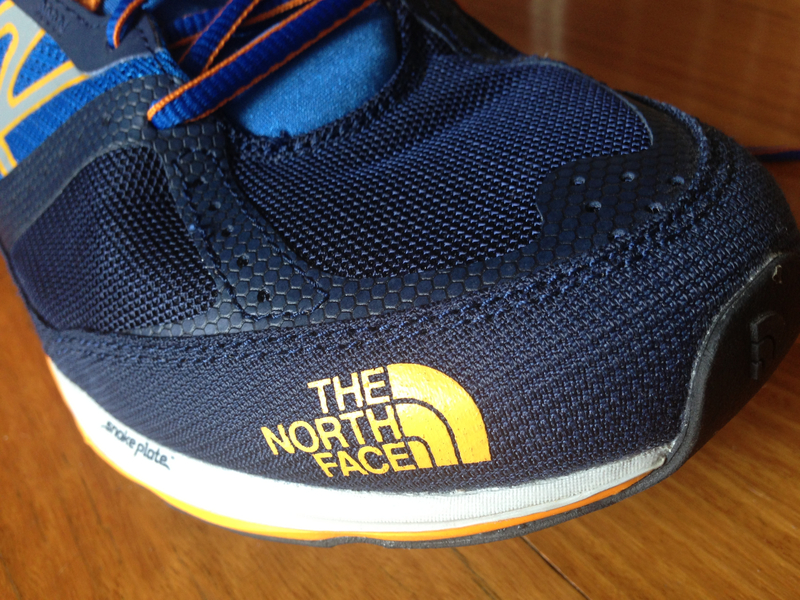 After the first run in the Ultra Guide the TNF logo on the toe came off. Only cosmetic and as it was sort of screen printed on this was always going to happen. It was the gel insert in the sole that came way next. It lifted and was unstuck approximately 3/4’s of the way around for about 100km of running before finally falling off somewhere out on the trails. The same thing happened on the left shoe about another 200kms later. Both are now missing and while initially I didnt notice them not being there. Psychologically it is annoying me as I know they were added to do something important like provide heel protection when your form gets lazy. So I dont want this to happen. 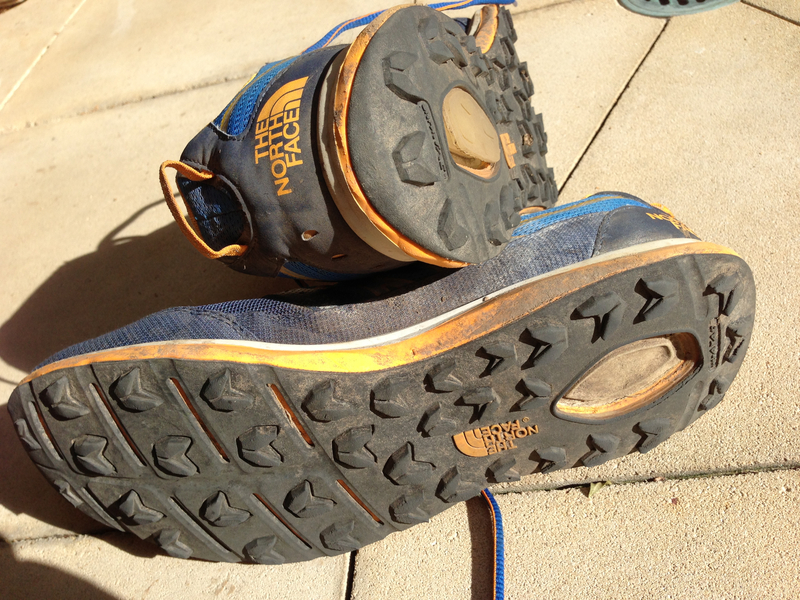 North Face have offered to replace this pair of shoes quibble free and I hope this is a one off. Another 600+kms of running awaits me between now and Western States and I really hope this pair stay together as I am now firmly settled on this shoe taking me to a buckle at WSER ! If you are looking for a long distance, well cushioned shoe, that feels stable, fast and offers a magnitude of grip rarely seen or felt with other shoes then you cant go past the Ultra Guide. The North Face have definitely backed up their commitment to trail running by rapidly developing this shoe and it is certainly a tick in the box for design and performance. We hope they get on top of build quality just as quickly. We expect to see a larger contingent of runners lining up at big ultras around the world in this shoe as it is without doubt their best shoe yet. Thank you to Footpoint Shoe Clinic for the opportunity to test the shoe and thank you to North Face for the offer of a replacement pair. great review. how true to size is it? Wore these at Six Foot with gaiters, not a single grain of sand got in. Really happy with these shoes, probably most under-rated trail shoe on the market. Nothing fancy and sit roughly in the middle in terms of weight, drop and outsole grip. Have over 400km on first pair, no durability issues. Great shoe!